After speaking with hundreds of families per year via email, video-chat, telephone correspondence, Facebook groups and in-person, it’s clear that parents are dealing with many of the same difficulties in their homes. Here are some challenges and recommendations to help you and your child with autism find some peace on the spectrum. Please share this autism resource with other families who you think could benefit. Handling food sensitivities and mealtimes. Getting your child to eat a variety of food without having a meltdown can be a tremendous game changer. Food sensitivities can be so overwhelming for everyone at the dinner table. Place a new food item on your child’s plate at every meal. You can expose him to the same new food for approximately 7 days, so that he gets used to it. He may have a difficult time with “new” things, so it’s important to give him many opportunities to be sucessful. If he doesn’t want to eat it, no problem. Just let him know that the food still needs to stay on his plate. Talk to him about the food, explain to him where the food comes from, and talk about what the food tastes like. If he absolutely cannot handle the food being on his plate, you can place it on a smaller dish next to him. Children melting down after school. When your child gets in the car or walks in the front door after a day at school, give him some downtime. This includes not bombarding him with questions and a million things that he needs to do. Allow him to disconnect, have a snack, read a book, and just relax. Keep in mind that he had to “hold it together” all day at school, and his sensory system has been overloaded. Let him participate in a calming activity that soothes his senses so that he is ready to face the rest of the day. If you need to talk to him about something, and he already seems overwhelmed, try writing your message down on paper. Post-its work great for this. You can also show him his visual schedule so that he can see what is happening next in his day, without you having to verbally remind him. 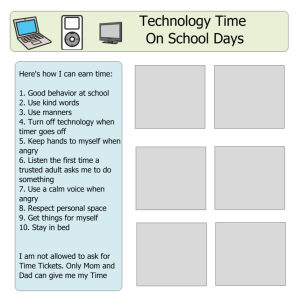 Handling electronics and screen-time obsessions. Your child is probably in-love with any device that has a screen. Screen-time can interfere with sleep and also contributes to meltdowns. Limit technology time in your home. If your child has a screen-time obsession, only use video games, iPad, and television time as rewards and reinforcers. Stop all electronics, including watching TV, at least two hours before bed. 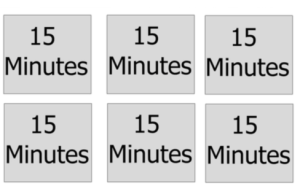 Use a reward chart like the one here (made with Boardmaker), so he can earn technology time in 15-minute increments. Start observing what your child’s behavior is like before and after he gets screen-time. If you notice that he is participating in more self-stimulating behavior, or has increased meltdowns after he plays a video game, then limit this time. Also, put parameters around when and where he is allowed to play. 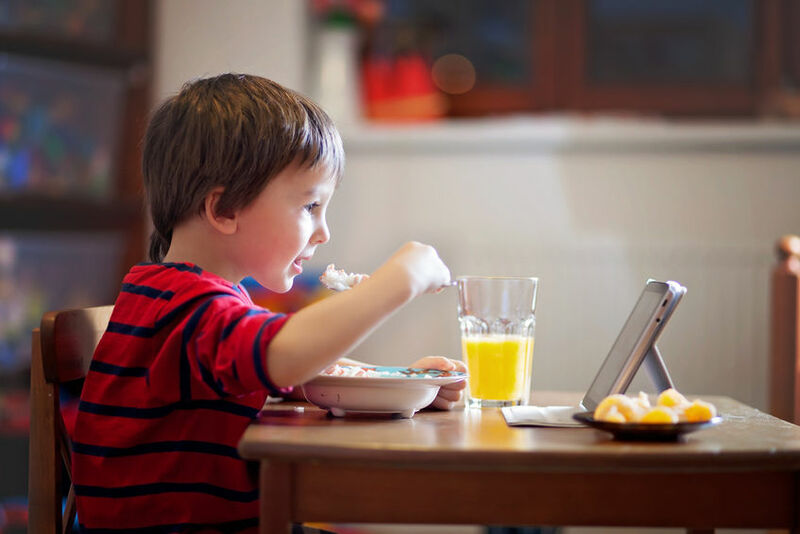 Discourage technology when he is in bed and also at the dinner table (unless this is the absolute only way you can get him to eat). By not allowing screen-time at the dinner table, you will be able to focus your efforts on communication and interaction. By discouraging technology in bed, you will be helping your child to have a good night’s sleep. 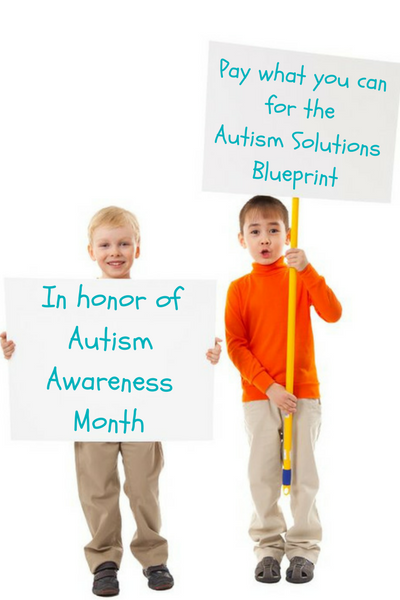 For more strategies and suggestions, be sure to check out the Autism Solutions Blueprint. You have until April 15th to join this program and pay whatever you can afford. Seriously! No strings attached. From April 1st – April 15th, you can join this program (at whatever price you can afford) and receive lifetime access! Thank you for sharing with us Lydia. I am sorry to hear that your grandson is going through such challenging times. Please let me know if you have any questions. I am here for you.